Starting with this blog post, and over the next few posts, I’m going to explain in detail what I have found out about internals for KakaoTalk — the most popular mobile messaging service in Korea. There are 15 million users, and the number is growing really fast. Multi-lingual support. They really try hard to push this application globally. They utilize localization, so it’s really easy for them to adopt any new language if they wanted to. Kakao, for some reason, doesn’t make a PC version of KakaoTalk. Some people have tried to make PC version in the past, but many stopped once every packet is encrypted with SSL and thus packet capturing is meaningless. KakaoTalk supports both Android OS and iPhone OS. 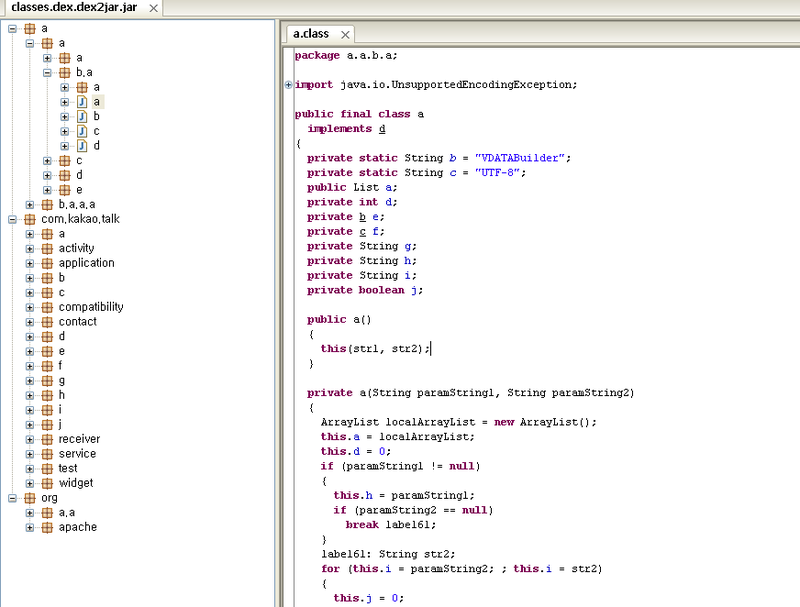 Obviously, Android KakaoTalk is in Java and iOS KakaoTalk is in Object-C. Uses the (very) similar protocol / data structure. They seem to use SVN to do version controlling, but failed to manage permissions properly. I didn’t look closely anymore, but there might be some juicy/useful information that can be gathered with this vulnerability. Webservers: http://www.kakao.com/.svn/entries , http://www.kakao.com/talk/.svn/entries, etc. Well, that took me a good 20 minutes or so of googling and poking at their servers. Not many interesting things.. So I decided to dig up some interesting facts about KakaoTalk! To do preliminary analysis on applications, I needed to grab the binaries from my iPhone and my friend’s Android. This was easily done by scp (secure copy) from my iPhone to my computer, since my device was already jailbroken. Now that I received two applications for KakaoTalk, one for iOS and the other for Android, I immediately started analyzing them. I guess we only have one option now! Open up the binary and reverse engineer! So we load up in IDA, and find these…awesome… wait.. what? All the symbols are stripped?! BUT! Whatever! Reverse engineering is more fun without symbols. Right? Again, the way Obj-C code runs is by event-driven function calls. Thus, there’s no such thing as control flow as in usual C or C++ programs. Another annoying thing about analyzing mobile phone is that we have to deal with either ARM or MIPS architecture. Note: For iPhone, the architecture is ARM. So, unless you have hexray-arm, you will have to go through awesome ARM opcodes. For Android, all the apps are java program that runs on Dalvik VM.. so it’s usually possible to use decompilers to recover the source code (or at least some kind of IL). Since two are almost exactly the same client, the program logic should also be very similar — which means that if we understand one thing thoroughly, we will quickly understand the other one as well, even with the protections/obfuscation. Ok, the binary for iPhone is stripped. How about Android one? Anyhow, are we stumped then? The answer is ‘not really’. Get (part of) code flow in iOS applications using debugger. Re-label the obfuscated java files to understand the program logic. And… using the information from above techniques + static analysis in IDA, we can actually disable SSL encryption — such that we can view non-encrypted packet data. In the next blog post, I will discuss and explain what exactly they do inside of the binary and show how I could bypass SSL and get a clean capture of the packets. Also in the following series, I will talk about their protocols, data structures and design. And of course, the security measures on each of them. Previous story PPP is going to DefCon19 Final!